Located between India and Tibet (Autonomous Region of Tibet, P.R. 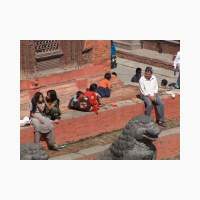 china), Nepal offers a fantastic array of attractions for visiting tourists. 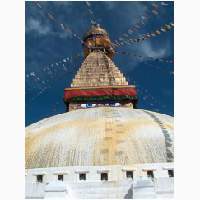 Nepal is best known as the home more to the country than just one mountain, albeit the highest mountain on earth. From the steamy jungles of the plains to the highest point on earth the range of scenery is so diverse and spectacular experience to those who would venture out, on foot, into the hills. 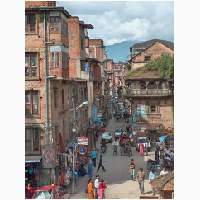 The people of Nepal are a cosmopolitan mixture of many different ethnic groups, some originating from the north and some having migrated from India. 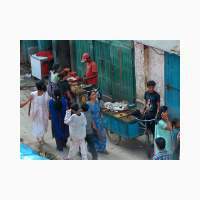 Over the centuries, newcomers have integrated into the society and what has evolved is the present mixture of people collectively known as Nepalese. 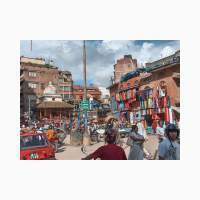 With more than sixty distinct ethnic groups speaking over seventy different languages and dialects and each having its own distinct culture, the experience for visitors to Nepal is unlike that to be found anywhere else. Add to this a diverse flora and fauna that defies imagination. Vegetation that ranges from Tropical to Alpine, more than eight hundred bird species, endangered animals, and the list goes on. 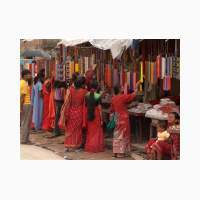 A well-established tourism industry is geared to meet your every need. 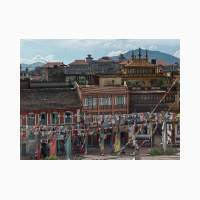 From luxury hotels to trekking teahouses. From mountaineering expeditions to trekking, from white water rafting to jungle safaris, there is something for everyone. The valley is situated at an altitude of 1336 meter above sea level and cover an area of 218 sq miles. 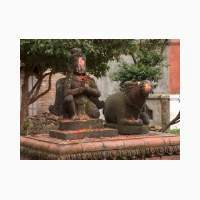 The rich tapestry of the culture heritage of Nepal is synthesized in the Kathmandu valley, the home of the ancient and sophisticated Newari culture. 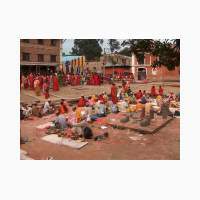 The Newars are the indigenous inhabitants of the valley and the creators of the splendid civilizations of its three cities – Kathmandu, Patan and Bhaktapur. 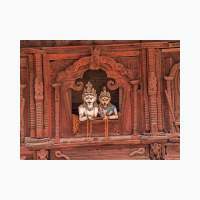 The skillfully-built temples and places, delicately-engraves stone and metal images, carved wooden columns and pillars, and the history laden shrines and chaityas of these three historical cities stand testimony to the Newar’s artistic achievements. 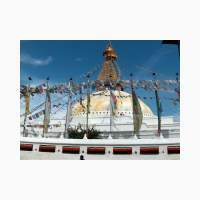 You can hire a mountain bike in Kathmandu and cycle through the valley. 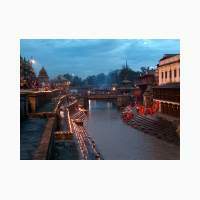 This is an interesting way to explore Kathmandu and the valley. 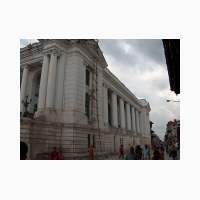 Pashupatinath temple is situated 5 km east of Kathmandu, the temple of Lord Shiva, Pashupatinath, with two tiered golden roof and silver door is considered one of the holiest shrines for Hindus. 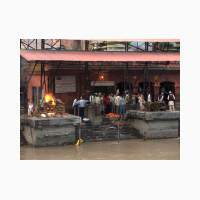 Although only Hindus are allowed inside the temple, visitors can clearly see the temple and the activities performed in the temple premises from the eastern bank of the Bagmati river. 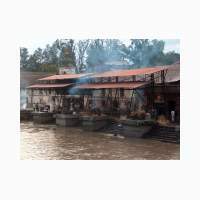 The Temple was listed in the UNESCO World Heritage Monument List in 1979. 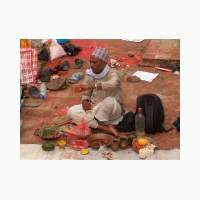 Here is the Maha Shivaratri festival celebrated the best and also the Teej festival. 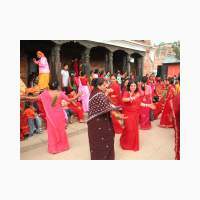 Teej is a Hindu’s festival celebrated by women. 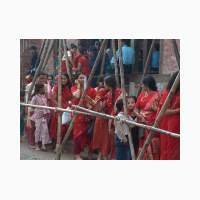 Dancing, folk song and the red colour of women’s wedding saris dominate the days of Teej. 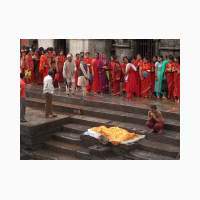 Women observe a fast and flock to Shiva temples where married once pray for a happy conjugal life and unmarried once for a good husband. 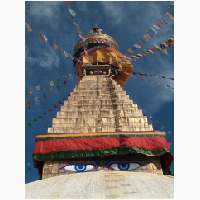 The stupa of Bouddhanath lies 8km east of Kathmandu.This ancient colossal Stupa is one of the biggest in the world and the center of Tibetan Buddhism in the world. It was listed in the UNESCO World Heritage Monument List in 1979. Here is Losar celebrated by many Tibetan people. 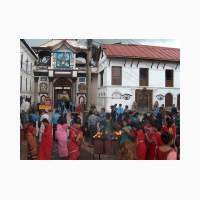 You will find many monasteries in the surroundings, that you can visit. Almost every saturday there is a teaching by a rimpoche lama, which is very interesting to join.